When Sherry Rankin heard her first full-length novel, Strange Fire, had won this year’s Crime Writers Association’s Debut Dagger competition for unpublished writers, she was stunned. “To be honest, I entered it mostly as a way to toughen up and learn to deal with rejection,” said Rankin, assistant professor of English at ACU. She had just completed her first draft of Strange Fire when she learned of the contest while reading about her favorite modern mystery writer, Louise Penny. 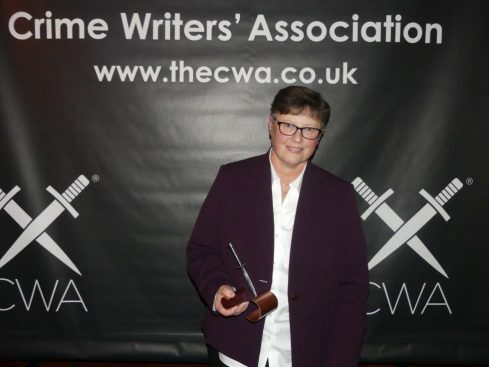 Penny got her start being short-listed for a Debut Dagger more than a decade ago and is now a best-selling author with her Armand Gamache novels. Hundreds of writers enter the Debut Dagger contest each year; those entries are then narrowed to a long list of 10, then to a shortlist of five. The winner is announced at a banquet in London each fall. In this Q&A, Rankin tells more about the novel and how it came about. Without giving away too much, what can you tell us about Strange Fire and its main character? The protagonist is a campus security guard named Abel Morales. He is a veteran who struggles from severe PTSD that prevents him from achieving his dream of becoming a police officer. The novel opens with the death of a student, which appears to have been an accident; but Abel finds a slip of paper in the dead boy’s room bearing the words “Strange Fire,” which piques his curiosity. An unexpected set of circumstances leads him to have a conversation with university psychology professor Luisa Argent, who also has serious doubts that the student’s death was an accident, and together they set out on a clandestine investigation of their own. How did the idea for the plot originate? It actually began with two news articles I read years ago: one about racial tensions at American universities and one about child trafficking from Mexico into the United States. I thought the two ideas could be merged together in an interesting way to create an intriguing plot. "One thing all good literature does is depict real people speaking and acting in real ways. The human condition is a messy affair; we are all a mixture of shadow and light, and even good people say and do things that are sometimes destructive. There’s an enormous difference between describing behavior and condoning it, and one serious challenge for me, as a Christian, was to write about terrible things in believable ways without attempting to whitewash the human condition. At the same time, I wanted to communicate my belief that God is at work in the world, using the most broken of us to effect positive change, and that glimpses of God can be found in the most unlikely places." The setting is a college campus. What details did you draw from your own experience working at a university? Did your experience at ACU help with the authenticity of the novel? My favorite novel of all time is Dorothy Sayers’ mystery, Gaudy Night, which is set on the campus of a fictional college at Oxford University, so I chose a university setting partly as an homage to Sayers, but partly because it seemed wise to “write what I know,” especially for my first novel. Although I did, of course, draw on my experience here at ACU to try to create a believable backdrop for the novel, and though San Dionisio University (the setting of Strange Fire) has some surface similarities to ACU, in that it is a private university in Texas, it is most definitely not like ACU in the ways that truly matter. There are some disturbing things going on at this fictional school involving racial, economic and gender discrimination (not to mention murder!) that do not at all match my experience with ACU. Probably my biggest concern about choosing a university setting was that I didn’t want readers to assume ACU was in any way the model for San Dionisio. What kind of research did you do for Strange Fire? I’m an English professor, so my first instinct was to read. I did a lot of reading and research about child trafficking; about the experience of Mexican immigrants in America; about the history and culture of South Texas near the border; about money laundering (all of which are themes that play out in the book). I’ve also had many students who are either the children of first-generation immigrants, or are first-generation immigrants themselves, and I spoke with some of them about their experiences. Are any of the characters based on people you have known? None of the characters are based on real people, though some are amalgams of several people I’ve known. I came up with the idea for Abel’s character because I thought it would be interesting to go against the norm of the savvy, powerful, masculine detective and instead have a protagonist who is almost completely powerless and without status or formal training. I thought it would be interesting to depict a person struggling against his own mental health issues and the social and racial prejudices of others to somehow achieve a sense of control and personal agency. "A lot of times, I feel like a surgeon trying to use a scalpel while wearing boxing gloves: the words are the scalpel, but I’m not skilled enough to use them as deftly as I would like. Reading a truly great writer’s words can be painful for me, because I get frustrated with my own lack of facility with words. To be honest, I let that frustration stop me from writing for years. But I finally decided that the only way to improve is simply to write." Do you have a favorite author? Who inspires your writing? I’ve always adored the classic mysteries of Agatha Christie, G.K. Chesterton, Dorothy Sayers and the like. I think that’s why I love Louise Penny’s work so much – she harkens back to that early 20th-century style of murder mystery. While Strange Fire is considerably darker and grittier than Penny’s novels, it adheres to a similar classical structure. As a young kid, I was fixated on the Narnia stories by C.S. Lewis, The Forgotten Door by Alexander Key and The Black Stallion by Walter Farley. I read those books literally hundreds of times, to the point that my mother actually forbade me to read them anymore because she thought I was limiting my exposure too much. As a teenager, I read all kinds of things, but I kept coming back to Sayers’ Lord Peter mystery novels and to Tolkien’s Lord of the Rings trilogy. As a teacher and an author, do you have any thoughts on the power of words? I can’t think of anything more powerful, but only to those whose minds have been conditioned to be sensitive to words. A lot of times, I feel like a surgeon trying to use a scalpel while wearing boxing gloves: the words are the scalpel, but I’m not skilled enough to use them as deftly as I would like. Reading a truly great writer’s words can be painful for me, because I get frustrated with my own lack of facility with words. To be honest, I let that frustration stop me from writing for years. But I finally decided that the only way to improve is simply to write. What was the most challenging aspect of writing a novel-length mystery? My inner critic. It’s easy to muscle that inner critic aside for a short project; it’s harder to tell her to leave me alone for years at a time. Other than the encouragement I received from my friends and my writing group, there were three quotes in particular that helped me a lot with that. One is Jane Smiley’s line: “Every rough draft is perfect, because all a rough draft has to do is exist.” Another is from Steven King: “I only write when I’m inspired. I just make sure I’m inspired every morning at 10 o’clock.” The third is from George McDonald (though he’s talking about spiritual progress, not writing): “Ignore thy feelings; do thy work.” I repeat those lines to myself constantly. They are hanging on the wall in my study at home. I also found Bird by Bird, Anne Lamott’s book on writing, extremely helpful. What’s your next step as an author? I’m not exactly sure, and I’m trying to leave that entirely in God’s hands. Since winning the contest, I’ve been contacted by various agents and publishers, and if someone wants to publish Strange Fire, that would be great. But I am incredibly happy with my life exactly as it is and perfectly content even if the book goes no further. It was worth doing just for the lessons I learned about myself and about the writing process, no matter what happens. I love my job and can’t imagine leaving teaching to write full time; but I do find writing a fun and satisfying hobby. I’m halfway through writing my second novel, and I plan to keep writing until it’s not fun anymore. Learn more about the Department of Language and Literature.